Who doesn't like potatoes? We are crazy about potatoes in this house. If I ask Medha what she wants for dinner, pat comes the answer: batatyachi bhaji. The oily kind. Ahem! I don't make it often but when I do there is silence at the table because silly chatter only detracts and distracts from the enjoyment of these potatoes. Batatyachi bhaji, roti and yogurt are akin to bliss for us. In fact we were enjoying ourselves so much that I forgot to take pretty pictures after it was cooked. So what you got is all you will get. Fill a pot with water. 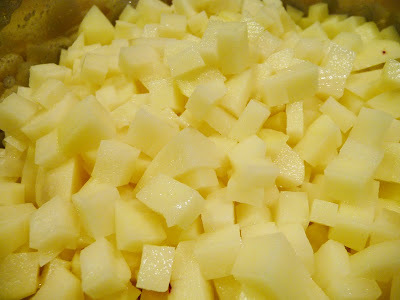 Peel and dice the potatoes into small equal sized chunks, about 1 cm cubes, and put these chunks into the pot to prevent blackening through oxidisation. If you are a quick chopper and dicer, feel free to skip this step. Heat oil in a kadhai or large saucepan. 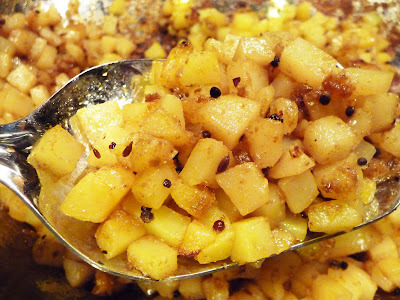 Add mustard seeds and when they pop, add asafetida, followed by cumin. Add turmeric powder and red chilli powder and add the drained potatoes quickly so that the spices don't burn. 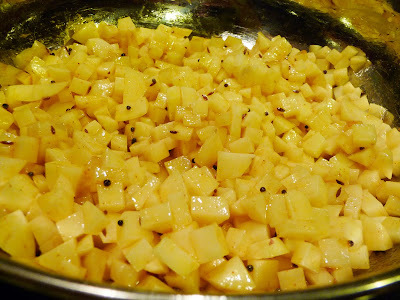 Mix well so that the potatoes are coated with oil. Cook on medium-high heat uncovered, stirring every so often until the potatoes are almost cooked. Add cumin powder, coriander powder, amchur and salt. Mix well. Allow the potatoes to cook. Let some of the potatoes become crisp as they cook. 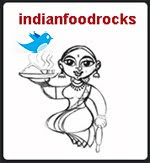 Serve hot with rotis and yogurt. These potatoes are a flavorful substitute for mashed potatoes and even hash browns. They pair well with roasts, too. This is a fair amount of potatoes for a family of three. We usually eat it over two meals. Medha loves to eat these potatoes as soon as she comes home from school. You could use less oil but it won't taste the same. This really needs to be fiery to be good and traditionally, this dish is a gorgeous red in color from abundant use of red chilli powder. I used to call it the lal batatyachi bhaji. 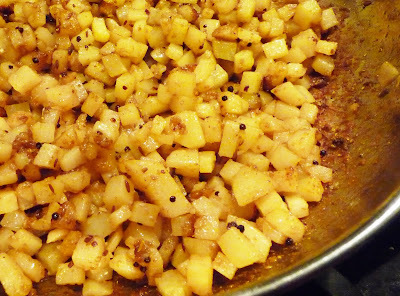 If you don't have amchur, you could squeeze lemon juice once the potatoes are well done. Potatoes+loads of fat+salt+chilli (with yoghurt)= BLISS! You just can't beat it! It is real comfort food. mmm...these kins od potato fry is my most favorite. With a simple dal rasam this would go a long way! ohhh carbohydrates!!! i want some - especially since tom and i are not eating any for the next two weeks! See, I always overlook potatoes. This sounds like the kind of potato dish I would crave though! These sound amazing! I am going to make those bad boys! This is one of my favourite ways to eat potatoes. oh this is the all goodies filling aaloo, they go in dosas, in pies, quick toasted sandwiches....and just with puri...... pure decadence!! Good ole potato.Never fails me! Wow, looks delish! I'm gonna have to try that one day! This one has already been made twice, within one single week! Add to this the til-aloo and past few days have been a potato fest :). Mmmm.. this was amazing! Made it for dinner with some rotis, baingan bharta and yogurt. The husband heartily approved. The leftovers made lovely sandwiches.. Thank you Manisha! Your recipes are simple yet so good. The other potato recipe I loved is the cocktail samosa filling. Tangy and so yummy. my samosas were bit of a flop show (I froze them and then fried; the filling didnt heat properly :( ) but the filling was absolutely delicious.